While searching for something completely unrelated, I came across this system by Arcana Creations for archetypal multiclassing. One might also call it class-and-a-half multiclassing, for reasons that will become clear. 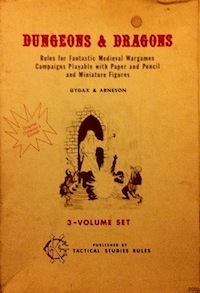 It was written for Castles & Crusades, but looks usable with any similar fantasy game. The basic idea is that a multiclassed character has a primary class and a secondary class, and the secondary class is reckoned at half the level of the primary class. It’s not explicitly stated, but I would say attack progression was take best. Though I prefer allowing all weapons (basing damage on hit dice) and armor (but making armor penalties more salient) no matter the class, I still think the “least restrictive weapon list but most restrictive armor list” is very elegant for those limiting weapon selection by class. Since you only really get access to the secondary class powers at second level (as first level is 1/0), there are few immediate benefits, so motivation is less likely to be power gaming. For example, a fighter/magic-user does not get to prepare any spells until second level, though they would be able to use magic items or cast from scrolls as a magic-user immediately. A first level magic-user/fighter would be able to wield any weapon though. One variation I might try would be to roll hit dice for both classes and then divide the total by two rather than adjusting the hit die itself since I like to re-roll hit dice every adventure. Example: Fighter/thief at level 5. With my hit die variation (and based on Moldvay hit dice), HP would be equal to (5d8 + 5d4) / 2. Minimum XP required (numbers from B/X) = 16k + (9.6k / 2) = 20.8k. Functions as a second level thief. At level 6 will function as a third level thief. This entry was posted in Uncategorized on April 5, 2012 by Necropraxis. That’s pretty elegant, actually. I would give that a go with LotFP. Thanks for the kind words — I put this together a few years ago when I started playing Castles & Crusades. At that time, C&C didn’t really have its own multi-class option. In terms of clarifications, the attack progression is the best available of the classes but it’s referred to ‘Bonus to Hit’ in the document to keep it in line with the terminology C&C uses. I always love the idea of the Gish but I was never too happy with the idea that they had to advance in both fighting and spell casting at equal paces to be effective (take a look at Eldritch Knight, Abjurant Champion and many others). The idea that I can be a magic-user with a knack for fighting or a fighter with a few magical tricks up my sleeve is very appealing. Even moreso that the class differentiation is very easy to pull off. Gish is a new term for me. Interesting. I also really like the primary/secondary aspect of this design. It’s been a while but as I recall it was either in the fiend folio or AD&D Monster Manual that referred to Githyanki fighter/mages as a Gish. I guess people liked it as the term caught on.